Download the controller by going to the polargraph download area and get the most recent bundle. Unzip it. 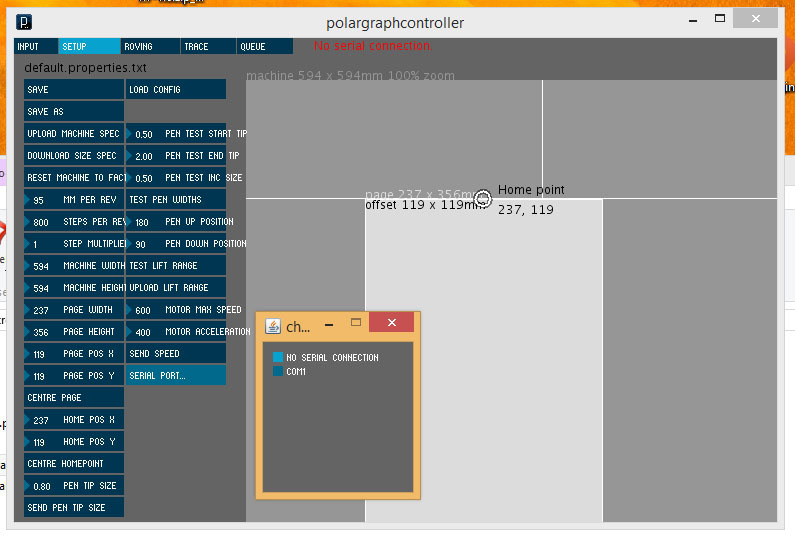 You’ll find there is an application inside called polargraphcontroller. Run it! If it doesn’t run (sometimes it doesn’t), you’ll need to run it from source code. This article on the Polargraph wiki explains how. When you press save properties in the top left corner, it saves your changes to it’s own internal properties file, so they will be there when you close and restart. If you’ve plugged your machine in already, unplug it now. Restart the controller app and go to the setup tab, press the serial port button. It’s the last one in the control panel. A smaller window should pop up with the list of currently available communication ports. You might have one, you might have a few, you might have none! Now close the controller entirely, plug in your PolargraphSD machine and wait a moment while any drivers are installed. Start the controller again, and look again at the communication ports – you should see one extra has appeared. This is the virtual COM port that your PolargraphSD is connected on. Select this new COM port, and keep an eye on the very top line of the main polargraph controller window – it should go green in a few seconds if you have selected the correct port. The command queue is the list of commands waiting to be sent to the polargraph machine. It is shown to the right-hand-side of the machine preview in the controller. The header can be clicked on to make it run or to pause it. When you start up there are a couple of commands pre-loaded. These set the speed of the machine, and the pen size. When you click the red header at the top, you will see the commands being to be sent to the machine until there are none left. The machine doesn’t know how big it is yet. After you have entered your machine size into the controller, you can tell it by pressing the upload machine spec button. This sends a couple of commands to the machine, telling it how wide it is, what kind of motors it has, how big it’s sprockets are, that kind of thing. The machine saves these settings internally for next time. Does your software work with adafruit motor driver? There is a version of firmware that runs on a MEGA or an UNO with the Adafruit Motorshield v1. It uses the AFMotor driver. If you follow the links to the instructable (above), then you’ll find a whole guide about how to assemble one. there is not to much in the way of more advanced options on your software. could you make a more in depth video perhaps on the software, so we know how to use the functions more thoroughly. I wanted to trace images, rather than use pixels or i wanted to have random scribbles for photo images so its more like “art” ish style drawings. Did you see the last video on the most recent blog post, titled “PolargraphSD – Vector trace and draw from SD card”? Here: https://www.youtube.com/watch?v=0xNSaxnORdg or of course on the very front page of polargraph.co.uk for the last month.